Why get a foeign start-up going in China? Development Reimagined was very pleased to be featured in a flagship programme by China’s Global Television Network (CGTN) called “New Money”, which explored this question. 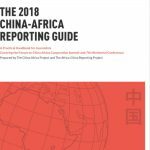 Have a quick watch of the video above to get a glimpse into what consultancies like Development Remagined and our partners such as China Africa Advisory can do in China.